Last year French turnover for French ski lifts passed the billion euro milestone for the first time. It is estimated that the industry as a whole (equipment, accommodation, après-ski, travel) is worth around 6 billion euros for the French economy. Those Halcyon days are but a dim memory as industry profits have suffered a meltdown after a winter of above average temperatures and bad press reports. Despite temperatures in the high 20°Cs some high-altitude resorts plan to remain open until the 8th of May but as the season draws to a somewhat premature close estimates suggest turnover will be down around 15%. This is causing major headaches for the industry. Some areas, such as Abondance in the Haute-Savoie, are poised on the verge of bankruptcy. The resort had to be run by the local council last year when it failed to find a buyer for the lifts. The ski area requires over half a million euros in investments. Even nearby Châtel suffered a drop of 7.5% in turnover with a reduction of nearly 24% in passenger numbers. After an extremely poor February the area in fact benefited from the early closure of Abondance which boosted visitor numbers towards the end of the season. In the Southern Alps the results were not as bad as feared, especially for the key six week winter holiday period that starts in February. Turnover is expected to drop around 10% overall. Early season snow was actually quite good, especially in areas such as Serre Chevalier and Montgenevre and most importantly, above 1800 meters. Lower resorts were only able to operate thanks to large investments in snow making. The situation was more critical towards the west of the region. Ceüse, close to Gap, didn’t open at all and is making a major investment in snow making over the summer. Other resorts were only open for a few weeks. The ski areas blamed a lack of week-end visitors for their poor results with the February winter holiday trade resisting well. Henri Nayrou, member of parliament for the Ariège said the Pyrenees didn’t lack snow, just that it didn’t fall during the key holiday periods of Christmas and February and this created “a very delicate economic situation”. At the end of February there were 31% fewer visitors to the region’s ski resorts with some small, low lying resorts closed for the entire winter. The Jura, Vosges and Massif Central were also very badly hit where many areas remained closed. According to the body representing French ski lifts, the SNTF, mid mountain resorts will see an overall drop of around 30% in turnover. The major ski resorts situated in the Northern Alps have faired better and even gained visitors from their lower lying competitors, a reverse of the last two winters. The fourteen biggest ski areas represent 50% of French turnover. Analysts say that they expect to limit the losses to just 2 to 3 % overall. Of these resorts la Plagne, les Arcs, Tignes, Meribel, Chamonix, Flaine, les Menuires and Serre Chevalier are controlled by the Compagnie des Alpes (CdA). The CdA is also set to acquire a majority stake in Val d’Isère and Avoriaz on the 1st of October 2007. Only Courchevel, Val Thorens, Alpe d’Huez and les Deux Alpes remain independent. The results vindicate the Compagnie des Alpes’ strategy to concentrate on high altitude resorts and invest in snow making. The climatic conditions are the major reason for the poor season. Snow arrived late and temperatures remained warm. 2 to 3°C above average during January and February. Only the end of February and March saw conditions close to normal. The temperatures made it difficult to run snow making. Resorts have also blamed the media for exaggerating the problems and lack of snow which they say were very different from resort to resort. They also say any good news got buried in the debate on climate change. Ski resorts have petitioned the government for aid. Haute-Savoie MP Martial Saddier and Henri Nayrou recently met with the Minister of Works Christian Estrosi to discuss a situation which they described as “very difficult” for the industry. The two MPs have asked for a range of measures including more aid to install snow canons to double the area currently covered, zero interest loans and extra unemployment benefit for season workers who were on zero hours contracts. Artificial snow cover is a contentious issue. Overall the number of skier days is expected to drop 10%, set against a rise of 4% last year. However the SNTF says that without snow making that figure would have been closer to a 30% fall. Artificial snow cover has enabled many resorts to remain open and is the main reason the season has not been as catastrophic as 1989-90 or 2000/01. 191 ski resorts now have some artificial snow cover with around 18% of ski runs equipped. About half the area compared to Austria or Italy. Last season 156 million euros were invested in ski lifts but it is expected that the emphasis will shift to snow making. There are already 20 reservoirs planned in the Northern Alps. At present around 55% of water for snow making comes from man made lakes with 30% taken from streams and 15% directly from the mains water supply. Snow making takes around 100 million kw/h to run. Resorts say that the water for artificial snow is reused but ecologists claim that snow making disturbs the natural water cycle and can change the eco-system. They also fear that much of the investment will be wasted with the on set of global warming. The ski station of Mas de la Barque in the Lozère department invested over a million euros in artificial snow making which has never been used. The ski area is closed and is due to be demolished. They are also worried about energy consumption with ideas such as refrigerated ski slopes. 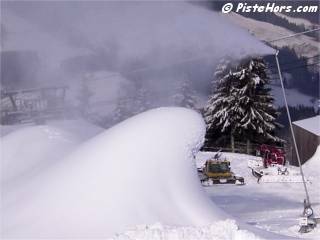 In the Ardennes one resort has installed 170km of pipe work to cool 7 hectares of slopes. Stats published on the Courchevel website indicate that total snowfall this season was roughly 9% below the 4-year average at 1850m. At 2700m, snowfall was greater; it was just 2% below-average. Dec 2006 was very poor (-43% below-average). Jan 2007 was poor (-25%). Feb 2007 was excellent (+73%). Apr was exceptionally weak (-93%). In short, 2006 / 2007 was an average season up high, but a below-average season down low. April 2007 (to date) has been 3.4°C hotter than April 2006 in Grenoble with just 10mm of rain overall. Meteo France say it has been the hottest April in record at Lyon (Bron) at 15.9°C beating the previous record of 14.0°C set in 1945. On Monday the temperature was 28.2°C beating the previous record of 28.0°C for a 23rd April. The absolute record for April of 30.1°C set in 1949 could also be broken later this week. There has only been 1mm of rain since the start of the month. The average is 75mm. Avoriaz has had a good winter with turnover up 10% and a 35% increase in skier days compared to 2006. Looks like the CdA is getting a good deal. The resort is open until the 29th April. The Haute Savoyard resort is also undergoing a rebranding and will in future be called “Avoriaz Resort” to reflect a diversification from the product of downhill skiing. The aim is to increase summer visitor numbers. The Queyras in the Southern Alpes has seen a drop of 15% in reservations over the last winter. The priority over the next 5 years is to move away from downhill skiing and develop summer activities. Economic stats certainly tally with robust results stated by some traders in La Plagne. I have spoken to a few in recent weeks who were very happy with their turnovers and margins for the season - attributing their good fortune to snowsports visitors seeking the ‘snow certainty’ of higher altitude resorts.